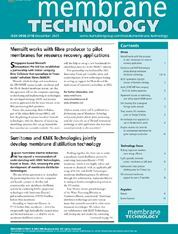 Membrane Technology brings you everything you need to keep up-to-date with what is happening in the international membrane industry, highlighting emerging markets, summarising important industry news and identifying new business opportunities for your company. • Technology news - all the latest developments including processes projects, contracts, systems, new products, testing facilities, etc. Membrane Technology covers the following areas: chemicals, pharmaceuticals, biotechnology, food and beverage, Brewing and wine, drinking water treatment, desalination, sewage treatment, oil and gas, mineral extraction, power generation, pulp and paper, and electronics.